Having a weak hand might move us to bluff, but we should also target hands our opponent might have. It's important to have a "target" (i.e., your opponent's possible hands) in mind when bluffing. Too often in no-limit hold'em, a player will arrive at the river with an airball and decide to bluff on that basis alone. It is true in theory that we should bluff the bottom of our range, and that we should sometimes bluff when we have no other way of winning a hand. But we also need to consider our opponent's range before making such bluffs. Will they ever fold? Do they have a mix of strong and weak hands? Will some of their hands fold to a small bet and others to a large bet? In other words, while having ourselves a weak hand might encourage us to want to bluff, we should also be targeting certain hands our opponent might have when we bluff. And we should realize as well that sometimes we just have to give up. Here's an example of a hand in which a player's own weak hand suggested to him he should bluff on the river. But how he went about doing so — namely, his sizing — needed to be better guided by the hands he should have been targeting with his bluff. This hand of six-handed 100NL ($0.50/$1) played online ends up with a big final pot, but it began with just a small raise to $2.25 from an experienced regular sitting under the gun with a deep stack of about $385. The button, also playing with almost $400 to start, called the raise, and a recreational player in the big blind with $145 called as well. The flop was and it checked to the UTG initial raiser who continuation bet $5. Immediately the button raised to $14. The recreational player ducked out of the way and the initial raiser called. With such a deep stack and having position, the player on the button should be flat-calling wider than normal preflop and he should also be raising continuation bets often with all kinds of hands — e.g., gutshots, two overcards, backdoor flush draws. Those are the hands with which he can exert foremost pressure. Therefore UTG should not be looking to make any big folds just yet. The turn was the . Keeping in rhythm, UTG checked and the button bet $17, continuing a story that he flopped a set (but could probably also have all sorts of 9-8s and K-Q type stuff). This is where the hand took an interesting turn. With gobs of money still behind, the UTG player check-raised to $70. Certainly it looks as if UTG is representing top set with A-A, or J-J or 6-6. The button just called. While the button has put a lot of money into the pot at this point, it should be recognized that actually, he should be putting a lot of money into the pot with many different hands. He would seem justified in calling a wide range preflop. He would be well within his rights to bluff-raise the flop often. And now on the turn it seems like he is getting quite large implied odds to chase a draw, with all the added comfort playing the river in position affords. So yes, under the gun looks strong, and no, the button calling $52 more to continue is not a cheap price with a K-Q or 9-8 or 4-3 type hand. But given how much is left sitting in the stacks behind — $290 effectively — continuing with a wide range of draws has its temptation for the button. On the other hand, should the button look to hero-fold any value hands? Certainly at this juncture a hand like looks ripe for the muck. With that he might be drawing dead and the board is only going to get worse. The stack depth works against him when he is holding on with bottom two pair. In any case, the button called and the river brought an almighty brick, the to make the board (although the highly unlikely 4-3 did get there). Under the gun checked. If UTG did check-raise the turn with top set, checking this river makes a lot of sense. He will still get a bet out of lower sets and top two pair, and he can also earn bluffs from the button. And it seems like the button does have a lot of potential bluffs in his range. So a check here doesn't automatically indicate a weak range. Then again, UTG does not have to have top set every time he checks this river. He, too, could have , , , or similar hands that, rather than play the turn passively, made a bid for the pot with that check-raise. These airballs are actually the same hands with which the button can most easily bluff. The pot is $170. The strongest hands the button can have in his perceived range are hands like , 6-5, A-5, and the occasional 6-6. 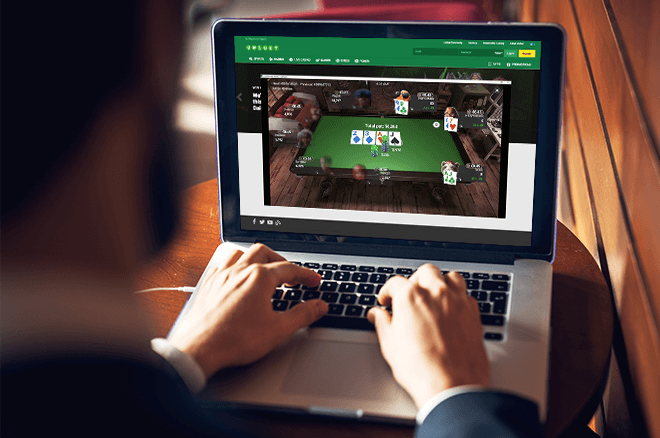 Because it does not take much to bluff an opponent holding air out of the pot, and because the button's value bets are targeting one-pair hands, betting something like $65 could make a lot of sense to represent both. Does this open the button up to being double check-raise bluffed? Sure it does. But if his opponent is capable of pulling the trigger for $290 in this spot, maybe the button doesn't deserve to win this pot with ! Well, as you may have guessed by now, the button went for the hammer, not just the tongs, and shoved all in for $290. Under the gun made a confident call with . And all the button could show for himself was . Now it's easy to look back and tell the button he shouldn't have thrown nearly $300 after the pot on the river. But has an additional problem here, namely its outs (hearts and the other three kings) look like its outs. At least can hit three outs to the nuts that look like "safe" cards, and then also bluff at hearts when it misses. The main problem, however, is that the button is targeting strong hands with this $290 bluff. Bluffing strong hands is a recipe for disaster, whether you have air or not. There are smaller fish to fry, and betting $65 to target the weaker portion's of UTG's range will take the pot nearly as often and for less than a quarter of the price.